Nicole Richie has just tweeted this picture of Katherine Power's boyfriend Justin Coit behind the scenes of Nicole Richie's clothing line 'Winter Kate' look book photo shoot. 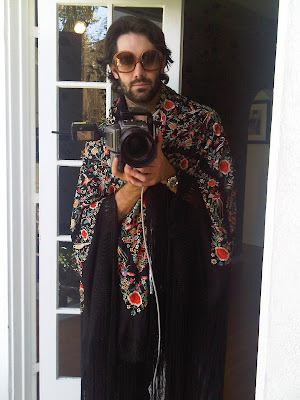 Nicole Richie tweeted - @justincoit getting into the spirit of things @ the Winter Kate shoot. I wonder if the floral shawl he is wearing is from The Winter Kate collection !? If so i am loving it. Well either way it is an amazing shawl, i am too excited to see this collection. ... :) isnt he wearing one of Nicole's Diors? The frame definately looks like one.